The Renwick Gallery opened in 1972 as the home of the Smithsonian American Art Museum’s craft and decorative art program. The collection, exhibition program and publications presented by the Renwick Gallery highlight the best craft objects and decorative arts from the 19th century to the present. For the past 40 years, the building has served as the nation’s premier site honoring the country’s best artists in their fields. 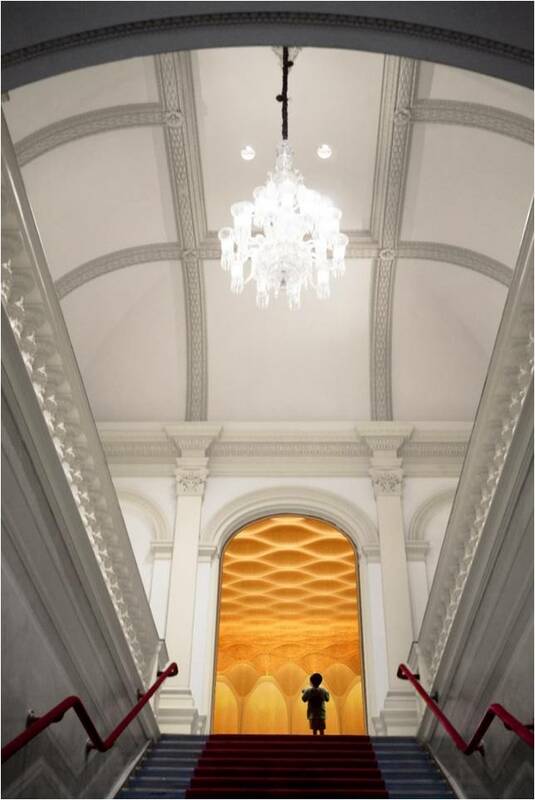 An international design competition in 2013 invited selected interior designers, artists, and architects to envision the Grand Salon anew as a must-see attraction for contemporary audiences. The design brings the forest to the city, referencing the original landscape upon which the city was built, which still exists as a remnant in the Great Pocomoke Swamp in the Delaware Maryland Virginia peninsula, less than 100 miles away. Building upon the classical geometry of the 4,300 square foot Grand Salon, an array of cypress veneer ‘lanterns’ is inserted, intended to evoke the ever-changing light of tree canopies while creating refined cultural space that relates to both art and nature. The raw cypress material is collected through selective harvesting and is progressively refined, using both analog and digital processes, reminiscent of the museum’s function. Ultimately, all of the wood material can be repurposed or recycled. 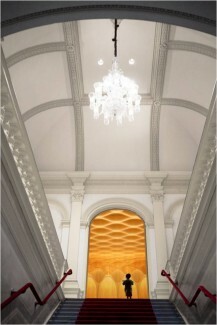 The room is self-organizing, responding and reconfiguring through a system of motion sensors and computerized actuators to accommodate the wide variety of programmatic functions held in the Renwick Gallery. The Grand Salon becomes a space ordered with change.